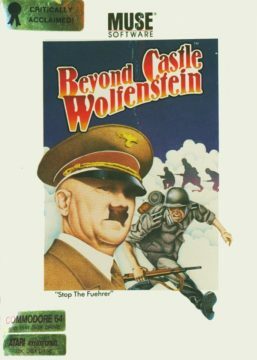 Muse Software’s sequel to Castle Wolfenstein sends you back into Nazi Germany, this time with the ultimate goal of assassinating Adolf Hitler. You start the game at the top floor of his bunker, and must make your way down to the third basement level, all the while searching supply closets for a briefcase full of explosives that a resistance fighter has hidden for you, then planting it outside of the Fuhrer’s conference room. You begin the game in disguise as a German officer, so from the start (and hopefully as long as possible), you must keep up appearances by showing your papers to any guards who demand to see them (or bribing them if you don’t have the right pass). Beyond Castle Wolfenstein is actually quite a bit more complicated and deep than its predecessor, given that this one has had another year in the oven. Instead of chests and lock pick timers, you must now raid supply closets, which are generally not locked, but sometimes are equipped with combination locks that you will need to manually crack using the number keys (quite possibly the world’s first lock picking mini-game). You use the number keys, 0 to 9, to guess at the safe combination; if you dial the first digit correctly, you hear a clicking noise. If you then dial the next digit, you’ll hear another click, but if you don’t dial the second or third digits correctly, the lock resets and you’ll have to dial the first digit over again. Supply closets can contain bullets, first-aid kits, alcohol, art, money, passes to show to guards, or other useless items like coat checks. There is actually a health system in this game, where before it was a random whether a shot would kill you or not. If you are wounded, you will move more slowly than usual, in a sort of limping rhythm. Finding and using first aid kits can fix this; otherwise, you’re basically a sitting duck if the guards come after you. If you accidentally alert a guard (by failing to show the correct pass a number of times in a row, firing your gun, or walking away from a guard who has told you to, “Come here!”), the alarm is sounded and officers will chase you through the bunker until you can deactivate it. You can attempt to “clean up” a mess that you’ve caused by dragging bodies around (pointing your gun at a dead guard and pressing “space” will drag them to your current position, at which point you can press “space” again to search them) and stashing them in corners where guards don’t usually patrol. It is also possible to kill guards silently, if you have found a dagger, by pointing your dagger at the guard and running into him from behind. This is difficult on some guards, because if they are facing you when you collide with them, you are arrested and have to restart the bunker. When you find the bomb in its supply closet, its timer is automatically armed, and you have 1000 (in-game) seconds to get it to its destination, or else it will go off, you will die, and the bunker is destroyed and a new one is generated. If you find the bomb, you do not immediately pick it up, so it may be useful to keep a map while playing and mark the location where the bomb can be found, so that you can leave it there until such time as you can come back and get it. It is also possible to reset the timer on the bomb while carrying it, but this must not be done in view of guards, or they will immediately sound the alarm. If you successfully bomb the conference room and kill Hitler, you are given a promotion to another rank, and any further generated bunkers will be more difficult, though there is the option to select a lower one without resetting back to the basic “Resistance Fighter” rank. As with the previous game, if you are caught or killed, the same bunker is reused until you either complete it or generate a new one. 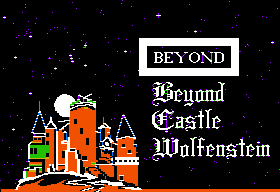 Like Castle Wolfenstein before it, Beyond Castle Wolfenstein was released on Atari 8-bit computers, Apple II+, Commodore 64, and IBM PC. The PC version looks the best, with characters actually being drawn in all three available CGA colors (in this case, the cyan, pink, and white palette), and there is support for composite monitors for improved color. Nazi uniforms now actually look like the real thing, with the belt and shoulder strap, instead of them wearing helmets and sweatshirts with swastikas on them. 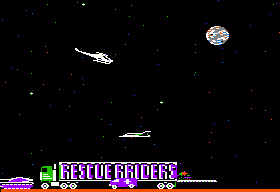 The Apple II version shares these new graphics, though naturally isn’t as clear in displaying them. 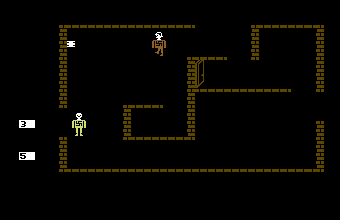 The Atari and Commodore versions just use the old graphics from Castle Wolfenstein. The Atari version does not contain the speech samples (which, by the way, are now clearer than before, thanks to improvements to Silas Warner’s “The Voice” system). Back in the day, some Apple II enthusiasts paid tribute to their favorite games by making “movies” out of them. Beyond Beyond Castle Wolfenstein is an animated reel that closely mimics someone playing Beyond Castle Wolfenstein – up to a point. The “player” spends all of his money bribing the guards, until he runs out and tries to bribe one with a credit card, at which point he is arrested and thrown into prison. The Nazis make the mistake of granting him his one phone call, which he uses to call, “RESCUE RAIDERS: Video Game Mercenaries.” They respond by sending in other famous video game characters, like Ultima’s Avatar, the Space Invaders, a Pac-Man ghost, and finally, the USS Enterprise, which destroys the castle with its phasers and then warps out. 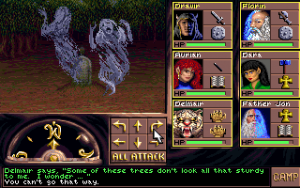 It’s just general silliness and doesn’t last more than a few minutes (even though it takes up both sides of a two-sided floppy disk), but it’s certainly amusing the first time around.